I’ve been experimenting with ebooks lately. I don’t have a dedicated e-reading device, just an app for my i-Touch, but it is enough to give me a taste of the e-reading experience and to teach me something about myself. The e-reading app lets me turn down the corner of virtual pages. The ability to stop mid-chapter and not lose my place is handy, but the folded corner is no bookmark. I don’t fold down the pages of my physical books. I will use anything at hand — a gum wrapper,a business card, a leaf, or a twig– in lieu of damaging the book by folding the page. Besides, bookmarks bring me joy. I recently gave my daughter the Garfield bookmark I treasured at her age. I held back a tear as I recycled the beautiful gold foil trimmed rose my mother gave me when I first started reading chapter books. It fell apart from years of use. Han Solo accompanies me on Sci-fi journeys and my “Meg Cabot’s got your back” goes well with comedy. I love promotional bookmarks from authors. The clever pitches get me excited to read what ever book is being advertised next. Sometimes, these pitches and a cute picture propel me to finish my current book faster so I can get started on the one touted by the bookmark. I know I’ll get a dedicated e-reader soon, but I’m not ready to give up paper books yet. I’m not ready for a world without bookmarks. You see, for the third time in as many years, my insurance company has decided to change the coverage of my asthma inhaler. I use my inhaler maybe six times a year because I have a mild form and I can by and large control it through lifestyle choices. You won’t catch me running a marathon or doing yard work on a hot, humid day. But when I need my inhaler, wow, do I need it. The inhaler I received last month when I filled my prescription will last me until it expires sometime in 2013. Then I’ll have to get a new medicine or pay full price out-of-pocket to continue with the same type. My co-pay was in the double digits and without insurance coverage it will hit three easily. The insurance provider suggested two alternatives, although one of them is in the highest co-pay category, the other is cheaper. But, according to them, they are not giving me any specific advice about which medicine I should take. The insurance company also made decisions about how I should take my medicine. I have another prescription for a 150mg dose of a medicine that comes in a 50 mg, 100 mg and 200 mg tablet. My doctor wrote my prescription for three 50 mg tablets. The insurance company decided I should get 45 100 mg tablets and have to cut fifteen of them in half to get my proper dose. It’s inconvenient, but more worrisome to me is that when I cut the pills myself, I see the powdery residue piling up on the cutting surface and the blade. Some of the pills split unevenly or a chunk cracks off the side. It’s important to keep an even level of this drug in my system, but because of what I see while splitting the pills and feel in my body, I know I do not receive a consistent dose day after day. Look, I’m grateful to have insurance but I wish they wouldn’t lie. They make a lot of decisions regarding my health, controlling certain aspects without having ever seen or spoken to me. The same cannot be said of my doctor or even my own judgement. I wish they’d let those who know me best decide what’s best. As part of my ongoing but occasional series of book reviews, I wanted to share my Goodreads review of The Reader by Bernhard Schlink, in slightly revised form. I wanted to like The Reader by Bernhard Schlink so much more and I think if you approached it as more of a lay reader rather than someone who has studied German history extensively it would be a better read. Another Goodsread reviewer described this book as a “Buildungsroman” and I wish I could remember who it was because they were spot on. The plot unfolds along traditional lines. A great deal of time is devoted to the loss of innocence, particularly the narrators sexual education at the hands of an older woman. We understand why the narrator is so smitten, but the woman, Hanna, remains aloof. I found this off-putting, particularly because the relationship reminded me of something that would be a sensationalist headline in today’s media like “Teacher seduces student.” I wanted to know her motivation, but was left wanting. The teaser on the back of the book promises a shocking reveal when the two meet again after a lengthy separation. For me, even the “surprises” were predictable and that may have taken away some of my enjoyment of The Reader. That being said, I think there is a lot to recommend in this book. I hope it is not a spoiler to say the relationship between Hanna and the narrator is meant to symbolize larger patterns of German history and an idea of who, if anyone, should be held guilty and responsible for past German crimes. For many people, this slim novel is a good way to open the door to a fuller discussion of morality, government crime, and the idea of who is a perpetrator and who is a bystander and why the distinction matters. The memory of the Holocaust is an important issue and The Reader considers who is responsible for keeping the memory but also if it is necessary to keep the memory alive and what is the burden of knowledge. On the other hand, for those already well versed in Holocaust literature and memory, there is not much to be gleaned from the otherwise predictable book. Gunter Grass, the former Hitler Youth, does a better job of addressing guilt, national character and responsibility and does so in more innovative ways. It is as if Schlink has bundled those ideas in a sexier more casual reader friendly form. You could do worse than The Reader, but you could also do better. When I told people I was going to Iceland the second most common response (after Iceland? Really?) was “Did you see that Anthony Bourdain Iceland episode?” Most people seemed certain I would starve during my visit and also reminded me that Anthony Bourdain called hakarl disgusting or something along those lines. fortunately, fermented Greenland Shark was not in season. Sadly, I missed Puffin season by a few days but starving was not a possibility. The food was actually good. Breakfast consisted of bread, cheese, meats, tomatoes, cucumbers, skyr, muesli and lots of rich dark coffee. Icelanders understand that if you can see through it, it ain’t coffee. Such a yummy breakfast kept me happy. Sometimes we stopped for lunch, sometimes we just grabbed a flaky crescent and a cup of coffee. More happiness. the first course, it made my list of the top five meals I’ve ever eaten. The creamy lobster soup was nirvana. It was a beautiful shade of pink with giant chunks of lobster jutting above the brim of the bowl. Icelanders reportedly drive hours just for the soup and I can understand why. The quality ingredients and simple preparation let the key flavors– cream, butter, lobster, garlic and tomato–stand out. Excuse me a moment. I must wipe some drool from my mouth. Okay. 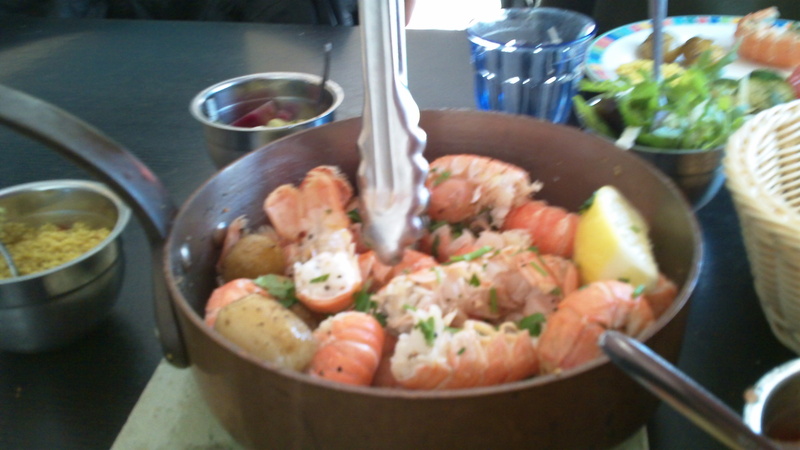 I’m back and on to the second course – a big pot of steamed Icelandic lobster (actually langoustinos), mini potatoes and lots and lots of garlic butter. I’m glad they came shell on because the few seconds it took to separate the meat from the shell slowed me down enough to appreciate the firm texture of the lobster and it gave me a opportunty to get garlic butter all over my fingers. There are simply not enough times we get the tactile experience of eating a messy meal with our fingers after we are above the age of three. The sides, an assortment of salads and pickled things, accompanied the lobster nicely. I finished with a big slab of chocolate cake and a cup of black coffee. It was almost too much. Almost, but not quite and that is why my dinner at Fjorubordid makes my top five meals list. I added a handy link so you can drool a bit too. My photos don’t do the food justice. So all in all, we ate pretty good in Iceland. I’d go back.